The Bunn family have been connected to the land for generations. They emmigrated from Shrewsbury in the United Kingdom to Albany in Western Australia in the late 1960’s. Their farming philosophy has always been to use natural farming methods with a focus on environmental responsibility. Today, the extended Bunn family agricultural interests span livestock production, horse breeding, country holiday accommodation and Bunn’s Vineyard and Winery. Irene and Richard Bunn, planted wine grape varieties to suit the local cool climate of the Great Southern wine growing region, located south of Mount Barker in Western Australia. In 1997 Cabernet Sauvignon was planted followed in 1998 by Shiraz vines. Seeking to produce iconic wines, the expertise of talented winemaker David McNamara was engaged until the 2008 Vintage to produce preservative free, natural wines from biodynamically grown fruit. Michael Garland has been the Consultant Winemaker overseeing the 2009 Vintage onward. Whilst the vineyard was developing a purpose built winery was constructed to produce the 2003 Vintage, that when released gained a cult like following. 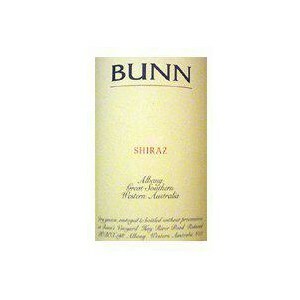 Bunn Wine has been included in the National Australian Slow Food Wine Library at the Melbourne Food and Wine Festival since 2006. The 2003 Vintage sold out in a very short time, which gave further inspiration to invest the extra care it takes to produce intense and complex wines. 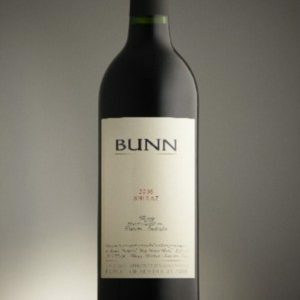 The demand for Bunn Wine and it’s popularity has steadily increased over time with all vintages selling out. The Shiraz and Cabernet Sauvignon vines are cane pruned and dry grown in rocky laterite soil on north facing slopes. Cane pruning produces concentrated fruit of low yield and high quality. The vines are unirrigated relying on rainfall only. Biodynamic preparations and natural inputs including farm made composts, dolomite, rock phosphate and limestone, promote the vitality of the vines and greatly enhance soil biology. There is no leaching of chemicals into groundwater or waterways. These methods enable a mineral rich & biologically active soil food web to nurture the vines which in turn produces healthy fruit in a clean environment. 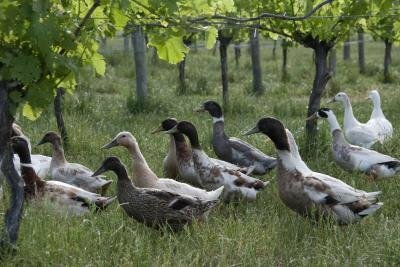 As there is no need for synthetic fertilisers, insecticides, fungicides or residual herbicides, we are able to allow ducks, chickens and guinea fowl to roam the vineyard, converting snails, grubs and beetles into plant available nutrients. The fruit is picked when flavour and tannins are at full ripeness and the weather is favourable. Wines that have mutli-dimensional aromatic and complex flavour profiles can then be created from the intense fruit produced at Bunn’s Vineyard. In Bunn’s Vineyard, the Shiraz and Cabernet Sauvignon vines are grown without the use of chemicals to produce low yields of very concentrated grapes, using only organic and biodynamic preparations, which greatly enhance soil biology. This leads to vines which are disease resistant and wines which have a natural purity and stability and complex flavour profile. Because of the cool climate, the grapes are harvested, typically in the second half of April when the fruit is ripe. They are transferred to the on-site winery and simply destemmed and crushed into small open beeswax lined fermenters. No additions of any kind, are made at this, or any other stage in the process. The fermentation begins spontaneously from wild yeast and proceeds for several days during which time the cap of skins is plunged by hand. While still actively fermenting, the tanks are emptied, the skins are basket pressed and the wine transferred directly to oak barriques where the fermentation runs to completion over the next few months. French oak barriques are used for maturation with about 10% new each year. The wine stays in contact with the fine lees for the first twelve months and is racked once prior to bottling. It is not fined or filtered and no sulphur dioxide is added. Only the finest quality corks are used to continue the trajectory of development begun by the oak. The wines are released ready to drink at about three years of age but will repay careful cellaring for several more years. Refer to the vintage diary to follow the progress of the wines.